I had the chance to use these at our Thanksgiving dinner. While I’ve used Chinet cups before, they had a tendency to snap easily and make sharp edges. I have a toddler how likes to drink from big boy cups so I had to use a squeeze test and was pleasantly surprised that the cup didn’t snap. I’m grateful that I received these complimentary to review because they make the beverages look prettier than an opaque cup, but I would have never repurchased without testing the new more flexible design! Chinet® Cut Crystal® Cup 9 oz. L.A. 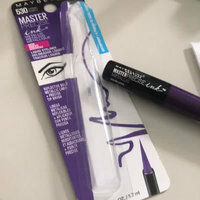 COLORS Color Craze Nail Polish has a Glows line that Glows under Blacklight just in time for a #HalloWIN and you can find it at Walmart I tried 2 coats of Ultra-Violet CNP165 which is a purple. So far it is holding up and no chips or smudging. Dries well, but definitely seemed to require 2 coats in order to be opaque. It doesn't require being "charged" to glow in the dark, but it does need a blacklight. I haven't tested how it is under black light so I'm reserving a star for now. This is a fun (and festive) way to celebrate Halloween and hopefully takes the place of the discontinued Wet N Wild Fantasy Makers Nail Polish Glow in The Dark which didn't give you a color in daylight. I seriously love the clean scent of tea tree/melaleuca oil! I started using the The Body Shop tea tree oil line after a friend recommended it in Ulta. Last summer I was a camp counselor and between sweaty and playing with the kids, I wanted something that was anti-bacterial to sanitize my body at the end of a work day in the shower. I used up my THE BODY SHOP® Tea Tree Skin Clearing Body Wash and it cleared and prevented back-acne "bacne" and chest breakouts. The peace of mind and aroma alone were enough to hook me, though! The one I purchased was during a sale at Ulta for extra points or something and had the white label packaging. I'm guessing this is the new, updated label. I kind of miss the old one. From the moment I open the linen-like box, to the refreshing tingle across my skin, this Origins GinZing™ Energy-Boosting Gel Moisturizer has me feeling pampered as though I'm in a spa. I loved unscrewing the lid and removing the hygienic topper to the aromas of pure citrus bliss! Typically, my skin is very sensitive and combination. Basically, I suffer from the trifecta of problem skin. Dry, sensitive, oily, and, of course, acne-prone. Needless to say I was skeptical that this would work as well as my Vanicream™ Lite Lotion for Sensitive Skin daily moisturizer. 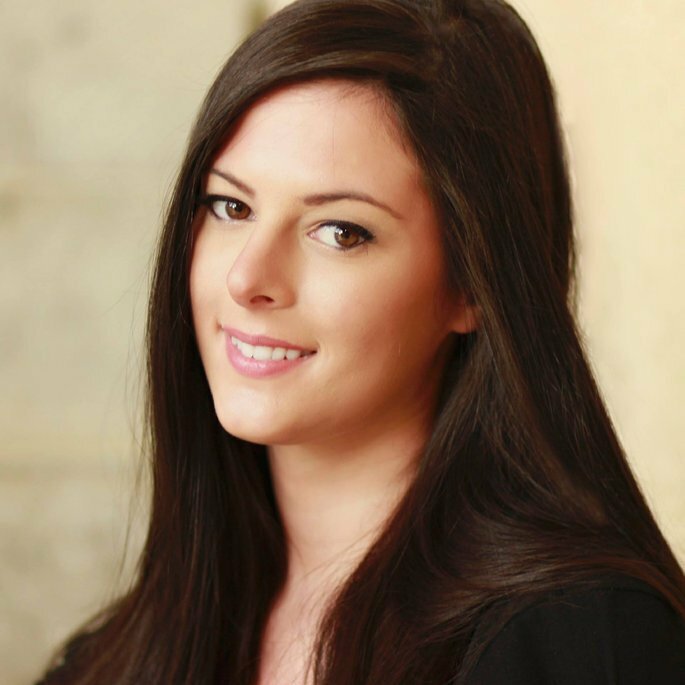 I was pleasantly surprised at how well my skin took to the GinZing™ Moisturizer! I'm currently pregnant, and addicted to citrus scents and essential oils lately. I've also been missing out on my coffee. This tiny jar is jam packed full of all of my favorite things! Lemon, Orange, Grapefruit, Spearmint, Caffeine, Ginseng (obviously), and that's not even all! When I found out it contained Grapefruit Peel Oil, I got even more excited; — I recently learned that it's one of the best things for preventing stretch marks. That being said, after testing this in my daily face routine, I started incorporating it as moisturizer for my baby belly bump, too! This is my first pregnancy and so far, so good! I also rub any extra left on my hands onto my hips, elbows, and any dry areas. My husband and I have both noticed how nice the scent is on my skin, which is just a bonus to the instant hydration! PRO: The GinZing™ Gel Moisturizer left my skin feeling just as clean as it did after washing. I tend to avoid thick moisturizer/lotions because I love the fresh-washed feeling on my face. CON: The jar is somewhat small, so I try to use it sparingly. 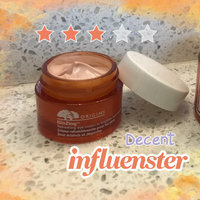 I received this full-sized product as a free sample from Influenster for the #DiscoverOrigins #WakeUpVoxBox campaign, but that did not sway my opinions in any way. 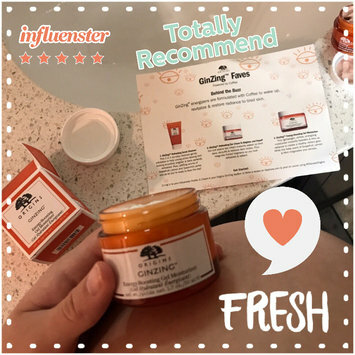 I received the Origins GinZing™ Refreshing Scrub Cleanser for free through the #DiscoverOrigins Influenster WakeUp!VoxBox campaign to test and review honestly. I was super skeptical to try anything new on my face while being in my last month of pregnancy. I have sensitive skin that's acne prone so I tested it on my hands first. I wish there was more of a foaming action once you mix the exfoliating beads with water. Other than that, the citrus aroma is so uplifting, I even use it at night in the shower! I have used it on my face morning and night with zero irritation at all! I feel the difference in smoothness instantly, and I love to finish with the Origins GinZing™ Energy-Boosting Gel Moisturizer, which has a matching scent and hydrates the skin without taking away the freshly washed feeling. I have so much fun trying this scrub in new ways. One night, I convinced my husband to let me give him (and his beard) a facial with it! I also had the idea of testing the scrub on my outer thighs and hips in areas I get cellulite. I've heard coffee tends to be a great remedy for that, as does massaging it in circles like the directions for the GinZing™ Scrub recommend. Oh. My. Goodness. The softness I felt days later is so glorious! My husband has noticed how soft and smooth my legs are because of it, too! I think I'm a little obsessed and I will definitely recommend this product!! Weakest link in the GinZing™ lineup. Maybe my first impression of the Origins GinZing™ Refreshing Eye Cream To Brighten And Depuff was negatively affected by the lack of citrus aroma. I started trying the eye cream as part of a daily routine to "wake up" my tired looking skin. 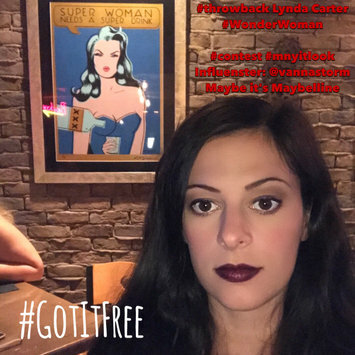 I'm almost 40 weeks pregnant and I've been using this consistently since Influenster sent me the Discover Origins Wake Up VoxBox for free to test and review. I wish I had checked Sephora first and watched the instructional video because I have definitely been applying too much product. To me, the eye cream reminds me of the scent of clay, which is cool and spa-like but not exactly refreshing. 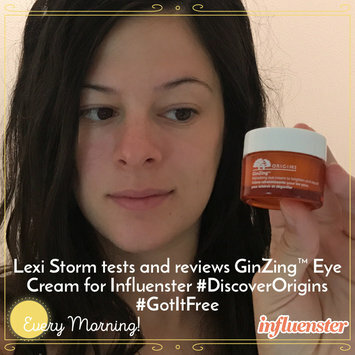 I actually like using the Origins GinZing™ Energy-Boosting Gel Moisturizer on my eye area better because my skin is very sensitive and that one doesn't bother it at all. One day, I was feeling bold and applied this eye cream to my upper eyelids. I got dry and peely moments later. I have, however noticed the Coffee, Ginseng, Green Tea, Cucumber (to name a few) ingredients seem to instantly brighten under my eyes and de-puff the dark circle/bags from lack of sleep. I'm 26, so I haven't considered myself the anti-aging cream category. This is the second eye cream I've ever given a try. I'll use up the rest of the full sized jar I was given, but unless it goes on sale or is part of a kit, I doubt I will repurchase. Cetaphil Gentle Cleansing Antibacterial Bar was “prescribed” by my dermatologist here in Florida. I buy the 3-packs at Target in the pharmacy/beauty section. I love it because it's antibacterial and shaped in such a way that my Clarisonic Delicate Brush Head-WHITE-One Size or my Michael Todd Lavender Soniclear Elite Cleansing System fit perfectly on the underside. At night, I wet the facial brush, switch on the device, and lather up by dipping it into the groove on the Cetaphil bar. I scrub my face with the normal timer on either device. It removes almost all of my makeup in one cycle. I wash the brush heads with bareMinerals Well-Cared For™ Makeup Brush Cleaner. I finish washing my face with one last lather up of the Cetaphil bar and lukewarm water using just my hands. It leaves me makeup-free and feeling really clean! In the morning, I do a simple wash repeating the last step. It washes away the oil on my T-zone and leaves my skin ready to start the day! Totally recommend. I am so excited to get my hands on this new lipcolor! I love a fresh lipstick that has a new top to easily apply to the Cupid's bow of the upper lip. 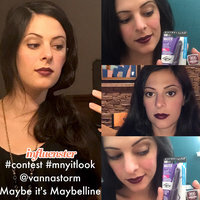 I received Maybelline Color Sensational® Matte Metallics Lipstick complimentary from Influenster for testing purposes. I tried #966CopperRose and I initially thought it was a deep plum shade. It's a cross between “vamp” and “steampunk” which I find totally awesome! Depending on the lighting, you can see the copper-almost-glitter tones. I love the multi-dimensional metallic finish without a glossy look. Originally I thought I might need a lip balm underneath, but as I'm wearing it, my lips feel softer. 4/5 stars because it doesn't pass the drinking glass test but after blotting my lips, it passes the kiss test. Will need to reapply for all day pigment.